Have a connecting flight from Mumbai? Even worse, did you miss that connecting flight and are struggling to spend a night in the city? Well, Holiday Inn Mumbai is your best bet. 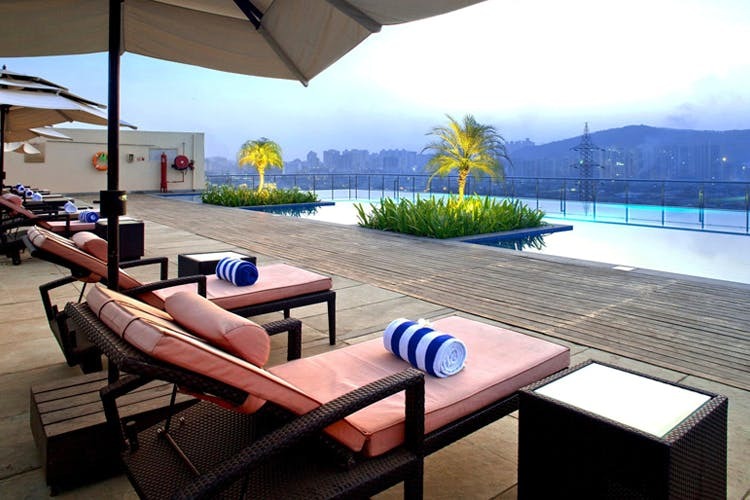 Holiday Inn Mumbai is the most apt place for you to loosen up before you carry on with your onward journey. If you’ve travelled by air, and have a flight to catch the next morning, just don’t think before checking in here. Why? Because this place has got something for everyone. You can either choose a regular room, or go for their suites if your pockets are feeling happier than usual. Soak yourself in the bathtubs (only for suite occupants), or walk-in for a hot water shower. While you get done with your pending business on their in-house wi-fi, you can enjoy your playlist just as you dock your iPod in their docking station. To rejuvenate and relax, you can head to Tattva Spa. If sweating it out and straining your muscles, they have a complimentary fitness center. And now that you’re spending the night in the city, why not unwind with you friends over for a drink or two at 72 Bar. And then head straight to Saptami for a contemporary, multi-cuisine dining experience. Comfort, a fuss free stay, and B&B – c’mon now! Don’t be greedy.